Curd/Yogurt plays a significant role during summer in our diet. During summer we generally make triple the quantity of curd what we usually prepare at home. My mum just dilutes it, add salt, asafoetida and keep it aside in refrigerator as natural thirst quencher. I can say surely that usage of curd can surpass any other ingredient used to reduce the body heat. No surprise if there is plenty of curd based recipes prepared during summer time. At least one recipe makes an entry everyday at home. Couple of weeks before I prepared pomegranate raita to go with Kushka Biryani, and of course got sometime to click a picture of it. Except the de-seeding part, the making of raita is very easy. Also it goes well with any kind of hot & spicy dish. You can peel and have the seeds well in advance and use it just before the dine time. You can have it as such or enjoy it with any biryani or pulao. 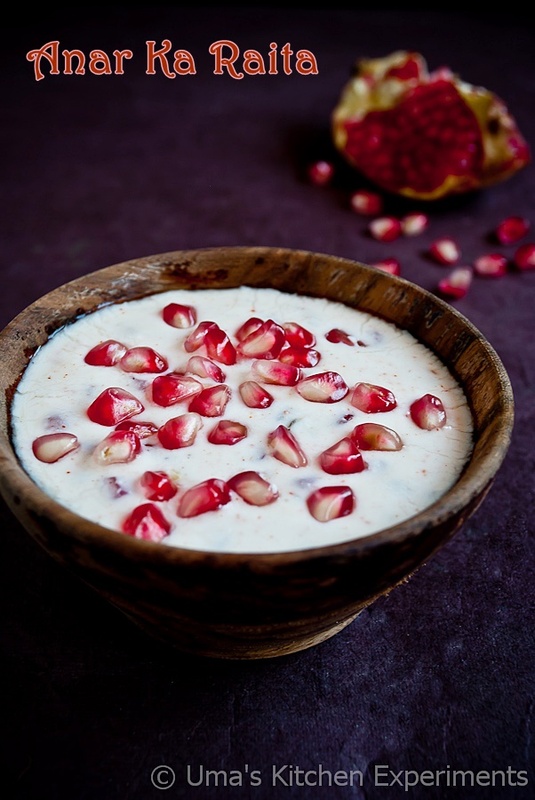 It is also called as Anar Raita or Anar Ka Raita in Hindi and Madhulai Raita in Tamil. 1) In a medium size bowl, beat the yogurt using whisk until it turns smooth in texture. 2) Then, crush the cumin seeds using mortar and pestle and add it to the beaten curd. 3) Add red chilli powder, black salt and garam masala. Mix well. 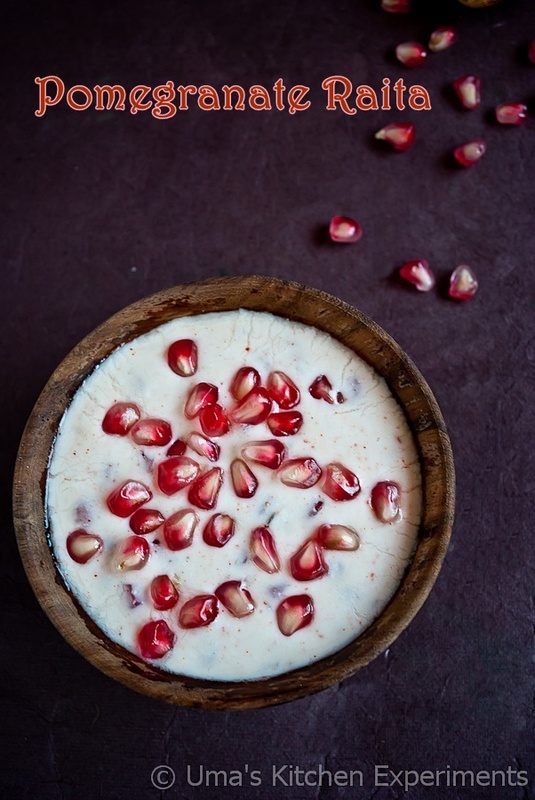 4) Save some pomegranate pearls for topping and add the rest to the curd and gently mix it. 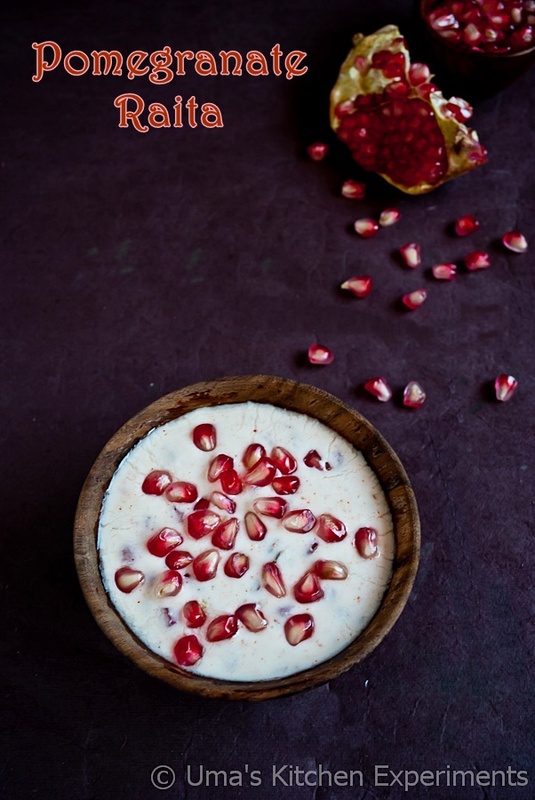 5) Top it with saved pomegranate pearls and serve it with biryani or pulao. 1) Cut the pomegranate as shown in the picture and break it. This way you can get the pomegranate pearls easily without much mess. 2) I always use freshly crushed cumin seeds for nice flavor. 3) Finely chopped coriander leaves or mint can be added to this raita. Very quick and healthy raita. Thanks for sharing.